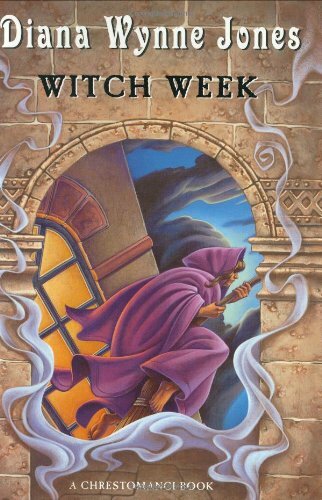 I’ve continued my chronological reread of Diana Wynne Jones’ Chrestomanci series with Witch Week, where the enchanter Chrestomanci plays a supporting (and somewhat deus ex machina) role. But on the other hand, can his convenient arrival really be considered out of place if he’s the main character of the series? Witch Week is the most independent book of the series. Set in an alternate England where witches (with real magic) are hunted, arrested and burned, several children at a rather awful boarding school each come to realize that they have magic. Their experiments and mishaps create escalating chaos until they’re in real danger of their lives…but fortunately they find a spell to summon Chrestomanci to their aid to unravel a problem of alternate worlds and mistakes in history. I think this may be the first Diana Wynne Jones book I ever read, long ago before I ever knew it was part of a series. I also think it was my first encounter with a reference to Guy Fawkes–and incidentally, when you don’t know who he is, you lose some of the impact of finding out that he successfully blew up Parliament in this world! Witch Week is essentially a boarding school story with a bullying thread and a magical twist. We get into the heads of several of the children, and Jones paints wonderful portraits of believable, complex individuals. Charles and Nan stood out the most for me. Charles is generally disliked in school, but mostly left alone because of the power of his evil eye glare. Jones successfully makes him sympathetic, even though he really does mean that evil eye glare. When he finds out he has magic, he’s perfectly willing to turn it on his enemies (with disastrous and often hilarious consequences). I think I enjoy Charles because, much as I also like Jones’ typical earnest, well-meaning boy-hero, it’s fun to get one who isn’t well-meaning! Nan is also a victim of the bullies, who are all too willing to accuse her of being a witch. When she finds out she really does have magic, she’s completely surprised by the jolt of confidence it gives her–not because she does anything with it, but just by knowing that about herself. Chrestomanci’s arrival towards the end of the book should have deus ex machina written all over it, but Jones manages more skillfully than that. Chrestomanci does organize things towards their conclusion, but the children still play such an integral role that he doesn’t take over the narrative too badly. And besides, if he’s really the main character of the series, perhaps he’s just asserting his proper place in things? I think you could do worse than to start the series here, because it’s so independent of the others. Although knowing who Guy Fawkes (and Chrestomanci!) are would probably add to the book. 🙂 In any order, this is another fun read, with a more bleak setting but a lot of humor and excitement to set against the gray background.